With mortgage rates near their historic lows, fixed rate home mortgages are likely going to be a much better deal if you plan on living in the house for an extended period of time, as when rates reset on ARM loans the prior short-term savings will likely be more than offset by the higher rates for the duration of the loan, which can cause the interest-only loan payment to exceed the amoritizing 30 year fixed rate payments if mortgage rates spike high enough. For your conveniene, Freddie Mac's PMMS rates have been included to the right. When it's time to buy a house, there are several things to take into consideration. It isn't all "location, location, location" as the old real estate adage goes. Not only does a perspective home owner have to determine how many bedrooms, bathrooms and square footage they want, or can afford, there is also the matter of how to pay for the home. Looking as various ways to buy a house, at getting a mortgage, there are fewer choices available than there were a few years ago. During the days of the real estate boom, lenders across the country were more willing to give out loans that were out of the ordinary, and based on risky terms. Since the housing market collapse, however, mortgage lenders have returned to safe and traditional forms of home financing. People interested in purchasing a home will find three basic types of mortgage loans: fixed rate, adjustable rate and interest only loans. As with any loan, mortgages of each type include interest. Monthly payments will be based the type of loan, the terms of the loan and the interest rate the home buyer is able to get from the lender. Mortgage interest rates go up and down in concert with the stock market. When the stock market is strong, interest rates are higher. When the stock market slows down, interest rates drop. As a rule, all mortgage lenders have the capability to offer the same rates. When a perspective home buyer shops for rates, they need to make sure they compare rates on the same day, at the same time, on the same program to get a true picture of what is available. Mortgage rates most closely follow the 10 year Treasury bond, but this is not an exact science. This is only used as a benchmark. Benchmarks are customarily used to set mortgage rates. The benchmark rate is the rate mortgage lenders must use to qualify mortgage borrowers who want a variable rate mortgage or a fixed rate mortgage of less than 5 years. A fixed-rate mortgage (FRM) is a loan where the interest rate on the note remains the same through the life of the loan. The amount of the loan plus interest is broken into equal monthly payments. As a result, payment amounts and the duration of the loan are fixed and the person who is making the payments on the loan gets the benefit of having a consistent, single payment and is able to plan a budget based on a fixed cost for a specific number of years. With a FRM, the interest payments are added to the front of the loan. Because of this, for the first several years of the mortgage, only a small portion of each monthly payment goes to paying off the principal. The majority of the payment pays the interest. Fixed rate mortgages are the most common form of home loans in the United States. Fixed-rate mortgages can be for 10 years, 15 years or 20, but most popular is the 30-year because that makes payments the lowest. An extremely long mortgage term offers few advantages to consumers. On a fully amortized 30-year fixed-rate loan at 5.25 percent for $250,000, the payments would be $1,380 per month. When the same interest rate and principal are drawn out for another 10 years, to a 40-year note, the payments drop to $1,247 per month. The home buyer saves $133 per month but it adds 10 years to their mortgage with a net cost of an additional $100,000. It should be kept in mind that the interest rate for the loan is 'floating' until the home buyer locks it in with their lender. Once the rate is locked in, the lender will provide the borrower with a disclosure statement showing that the rate is set. Once this is done, the lender has set aside the mortgage money for the home buyer and is has the agreed upon rate locked in. The borrower is then protected if rates go up. Unlike adjustable rate mortgages, fixed rate mortgages are not connected to an index. Instead, the interest rate is set (or "fixed") in advance to a publicized rate. Interest rates are usually shown in increments of 1/4 or 1/8 percent. The fixed monthly payment for a fixed-rate mortgage is the amount paid by the borrower every month that ensures that the loan is paid off in full with interest by the end of its term. A fixed rate mortgage usually costs the borrower more than an adjustable rate mortgage does. Because of the intrinsic interest rate risk, long term fixed rate loans will usually to have a higher interest rate than a short term loan. The relationship between interest rates for short term and long term loans is expressed by the yield curve, which generally slopes upward with longer term loans being more expensive. For the short term loans, the curve slopes down and is known as an inverted yield curve. This occurs less often. Just because a fixed rate mortgage has a higher starting interest rate does not mean that it is a worse form of borrowing as compared to an adjustable rate mortgage. If interest rates go up, adjustable rate mortgage rates and payments will also go up while the FRM will remain the same. What this mean is that, in effect, the lender is to taking the interest rate risk on a fixed rate loan. There are studies which show that the majority of home buyers with adjustable rate mortgages tend to save money in the long term, but that some others will end up paying more. The potential to save money is offset by the risk of possibly higher costs. In each case, home buyers will need to make a loan choice based on the length of the loan, the current available interest rates, and the odds that the rates will go up or down during the life of the loan. Longer term fixed rate mortgages are a better deal for consumers as a rule. If interest rates go down, a home buyer can refinance their mortgage at the new lower rate. If interest rates go up, the home buyer is protected with a fixed rate that it locked in. The biggest differences between 15- and 30-year loans are obvious. Fifteen-year loans have higher monthly payments, but the home buyer pays less interest, while 30-year mortgages may have lower monthly payments, but the home buyer will pay more for the house over the length of the loan. There are other important things to consider when deciding which loan to go for, such as retirement savings, how much financial risk the borrower is willing to take, and the ability to sustain the payment. As with most other areas of personal finance, this decision is about more than just the math. Rates and payments stay the same for the life of the loan. There won't be any surprises even if interest rates rise out of control and mortgage rates head to 20 percent. Loan stability makes it easier for setting a budget. People can manage their money with more certainty because their house payments don't change. FRM loans are easy to understand, so they're good for first-time buyers who wouldn't know a 7/1 ARM with 2/6 caps if it jumped up and bit them in the nose. In order for borrowers to take advantage of falling rates, these mortgage holders would have to refinance their mortgage. That could mean as much as a few thousand dollars in closing costs, another trip to the title company's office and several hours spent digging up financial information the lender needs. Refinancing can be too expensive for some borrowers, especially in high-rate environments, because there is no early on payment and rate break. FRMs are pretty much identical from lender to lender. While lenders have many types of ARMs available, most lending institutions sell their fixed rate mortgages on the secondary mortgage market. As a result, ARMs can be made to fit for any individual borrower, while most fixed rate mortgages cannot. Unlike a fixed rate home loan, which has a fixed interest rate for the life of the loan, the interest rate on an adjustable rate mortgage, or ARM, changes at contracts, agreed upon intervals. After the initial, fixed rate period, most ARMs adjust every year on the anniversary of the mortgage. In reality, the new rate is set about 45 days before the anniversary date, based on the specified index used. But some rates adjust as often as every month. If that's too much risk for a home buyer, a fixed rate mortgage is the better choice. Initial interest rate. This is the interest rate that is used at the beginning of the ARM. The adjustment period. This is the number of years that the interest rate on an ARM will stay unchanged. The interest rate is reset at the end of this period, and the monthly loan payments are recalculated. The index rate. Most lenders connect ARM interest rate changes to changes in a common index rate. Mortgage lenders base ARM rates on a variety of indices, the most common being on one-, three-, or five-year Treasury securities. Another common index is the national or regional average cost of funds to savings and loans. The margin. This is the percentage points that mortgage lenders add on to the index rate to determine the ARM's initial interest rate. Interest rate caps. These are contracted limits stating on how much the interest rate or the monthly payment can be changed at the end of each adjustment period or over the life of the loan. Initial discounts. These are special interest rates, often used to entice customers, offered for the first year or more of a loan. They lower the interest rate below the prevailing rate, which is the index plus the margin. Negative amortization. This is defined as the increasing of the mortgage balance. This happens when the monthly payments are not enough to pay all of the interest due on the mortgage. This may happen when the payment cap negotiated in the ARM is so low that the principal plus interest payment required is greater than the payment cap allows. Conversion. This is an agreement with between the lender and the home buyer that allows the buyer to convert the ARM to a fixed-rate mortgage at specific times during the life of the mortgage. Prepayment. Some loan contracts may require the home buyer to pay special fees or penalties if the ARM is paid off early. Prepayment terms are usually negotiable. How much the interest rate can be changed over the life of the loan, often called life cap. The total interest rate adjustment on an ARM is usually limited to 5 or 6 percent for the life of the loan. Caps on how often the interest rate can be changed may be broken up into one limit for the first interest rate change and a different limit on following periodic changes, for example a 5 percent change on the first adjustment and the 2 percent change on ensuing adjustments. Interest rate changes are part of the risk inherent in an adjustable rate mortgage. The interest rate and the payment based on that rate are fixed for a specific number of years. Because the payment is usually be based on only the interest, the borrower is not paying down on the principal. When the interest rate it resets, the payment can go up pretty significantly, even if the interest rate doesn't change very much. Features lower rates and payments at the beginning of the loan term. Because lenders can use the lower payment when qualifying borrowers, borrowers can often buy a larger home than they could otherwise afford. Allows borrowers to benefit from falling rates without having to refinance their mortgage. Instead of having to pay closing costs and fees for refinancing, ARM borrowers just sit back and watch the rates - and their monthly payments – go down with the interest rates. Helps borrowers save more money and invest it. Borrowers who have a payment that is $100 less can save that money and earn more off it in an investment. Offers a less expensive way for borrowers who don't plan on living in one place for very long to buy a house. Interest rates and borrower payments can rise drastically over the life of the mortgage. A 6 percent ARM could end up being an 11 percent ARM in just three years if interest rates rise sharply. The first adjustment can be dramatic because some annual caps don't apply to the first adjustment. A borrower with an annual cap of 2 percent and a lifetime cap of 6 percent could, theoretically, see the interest rate shoot from 6 percent to 12 percent a year if rates everywhere skyrocket. ARMs are very involved and hard to understand. Lenders have a lot of flexibility when setting margins, caps, adjustment indexes and other things, so uneducated borrowers can get confused easily or taken advantage of by less than honest mortgage companies. On certain ARMs, called negative amortization loans, mortgagees can end up owing more money than they did when they took out the loan. That's because the payments on this type of loan are set so low to make them even more affordable that they cover only part of the interest that is due. The unpaid portion of the interest gets rolled into the principal balance. An interest only mortgage is one in which the borrower only has to pay off the interest that accrues on the money that is borrowed. Because only the interest is being paid, the interest payments remain fairly constant throughout the term of the mortgage. However, interest-only mortgages do not last forever. The borrower will eventually have to pay off the principal of the loan. Interest only mortgages can be a good choice for first-time home buyers because it lets young people to put off large payments until their incomes grow and they become more stable. At the end of the interest only mortgage term, the home buyer can do a couple of different things. They can either renew the interest only mortgage for another set term or they can repay the loan it through standard means, such as entering into a fixed rate or an adjustable rate mortgage. There are several things to do to prepare a perspective home buyers' financial situation to make it ready for getting a mortgage. Saving up money for a down payment and closing costs, making sure the borrowers' credit score is high enough and credit report is in good shape are necessary steps to take to buy a home. The higher a credit score a person has, the easier it will be to borrow money at a low interest rate. To make sure a home buyer can get the best possible deal, they should check out their credit score by ordering a copy of their full credit report. A free credit reports that they can get will list all of their creditors but it doesn't necessarily give them their numerical credit score, often referred to as a FICO score. Home buyers should check their credit score well in advance of when they are ready to get a loan, so that they will have time to take any necessary steps to repair any identified problems on their credit report before applying for a mortgage. If the credit score is low, the future home buyer should spend at least six months making all loan payments on time, paying down or paying off the balances on their credit cards, closing cards that aren't used, and not opening new cards or getting into any other kind of debt. Always remember that good credit is not built in a short amount of time. It is best to show lenders a longer time frame to look at: a substantial history of good credit is always better than a short period of good history. It is advised that borrowers should check their credit reports each year from the three major credit reporting agencies, Experian®, Equifax® and TransUnion®. Mistakes on a person's credit report can pull down their credit score and need to be addressed. If a person's bad money habits are pulling down their credit scores, now is the time to change the. If someone is considering getting a mortgage, they need to understand that their FICO score cannot be repaired in 90 days. It can take anywhere from six months to a year. So, what credit score does a person need to get a mortgage? Following the collapse of the housing market and in the wake of the mortgage foreclosure crisis, lenders have raised their minimum credit score requirements. The government-sponsored enterprises (GSEs) Fannie Mae and Freddie Mac, for example, don't just have minimum credit score requirements: for every twenty points that an applicant's credit score falls below 740, they have to pay equally incremental higher fees. Yet many lending experts have stated that credit scoring is highly unreliable and is not really a good predictor of the whether or not a home buyer can afford a mortgage. Fannie Mae and Freddie Mac will provide a mortgage to someone with a 620 credit score, although they will probably require the borrower to have a big income, lots of assets, and a huge down payment. On the other hand, Fannie Mae and Freddie Mac won't touch someone with a 619 score. So is giving a mortgage to someone with a 619 score a greater risk than giving one to someone with a 620 score? Is the credit scoring model that precise? No, it isn't. A person needs to consider the information that goes into how the credit score is arrived at. Almost everyone's credit report contains errors, through no fault of their own. Some creditors update their accounts immediately; some can take months; some creditors don't update their accounts at all. Some credit reporting firms are accurate; others are sloppy. If, for example, a person shops for a mortgage or car loan, all of the credit score inquiries requested in a 30-day period are supposed to count as just one inquiry for credit scoring purposes - but that doesn't always happen. If the lender doesn't input a specific code showing the reason for the inquiry, each request can deduct five points from a person's score. Other common errors include not reporting a person's high credit limit. Using the high limit is 35% of a person's score and not using it hurts the overall score. Reporting home equity loans as revolving accounts like credit cards can make it look like a person has too much revolving credit, which, again, hurts someone's credit score. One good thing about the way mortgages are priced is that bringing up a credit score by even a few points can save a home buyer thousands in fees. For example, if a home buyer is applying for a 95 percent loan, improving their credit score from 679 to 680 drops 1.5 points from their fees. That's a $3,000 savings on a $200,000 loan. Unfortunately, the burden is on the borrower to find and correct credit report errors. If a person is applying for a mortgage and needs to get their report fixed fast, there is hope. The perspective home buyer will need proof that the erroneous information is incorrect. They then provide this proof to their mortgage lender, and it employs a rapid re-scorer to fix the borrower's credit report. Rapid re-scorers will only work with mortgage lenders. Borrowers can't go to rapid re-scorers directly for help. Another option that may be available to the borrower is re-aging. If a person has a good payment history with a creditor, and then makes a late payment, the creditor may agree to re-age the account. That means the payment is not considered as late. The VA home loan program was established in 1944 when the Servicemen's Readjustment Act added a group of benefits to eligible service members. It is over seen by the US Department of Veterans Affairs - the VA.
VA home loans are especially fitting for eligible veterans and their families who need to a mortgage for more than 80 percent of a home's appraised value or purchase price, because mortgage insurance is not required. FHA does not add extra charges for lower credit scores, so if a home buyer's FICO is lower than 740, they won't have to pay extra if they choose FHA financing. FHA also sets its minimum credit scores at 580 for a home loan with a 3.5 percent down payment and 500 for a mortgage with 10 percent down payment. That's the ideal "on paper" requirements. In actuality, though, it's extremely difficult o get a mortgage with very low credit scores. FHA may agree to issue a mortgage that way, but 80 percent of other mortgage lenders have more strict requirements, including having a minimum credit scores ranging from 600 to 660. The FHA ranks participating banks on how well their insured loans do. Poorer-than-average performance can mean that a lender may lose its FHA approval. Because of this, banks have almost no reason to give a mortgage to someone with a lower than 580 FICO. Low FICO loans are just as profitable as high FICO loans but they are also much riskier. That's just one of the reasons that the average credit score for successful FHA borrowers is over 700. A lender can give a perspective home buyer an idea of how much they can borrow by pre-qualifying them for a mortgage. To pre-qualify, a borrower will meet with a lender and give them information about their assets, income and other monies they have going out. Based on the information the borrower provides, the lender can give them an estimate how much money they will be able to borrow. Knowing this amount beforehand will allow the perspective home buyer to have an idea of the price range of homes they can afford before they go looking for a house. The pre-qualification process is not as formal as applying for a mortgage. The lender does not check out all of the information the borrower provides, does not charge a fee and does not actually agree to approve a mortgage application in the amount the home buyer is pre-qualified for. However, if someone is serious about wanting to buy a house, they will need to get pre-approved for a loan. With a pre-approval, the lender checks the borrower's credit, verifies their financial and employment information and confirms the borrower's ability to get a mortgage. Pre-approval makes the home buyer's position stronger when they make an offer on a house that they find and want to buy. Sellers are usually more willing to consider an offer from someone who has been pre-approved, because it usually means that the buyer actually is financially able to purchase the house. As the real estate industry struggles to recover, self-employed people and others with an irregular income could be caught in a squeeze as mortgage lenders continue tightening up on lending requirements. IF lenders only look at self-employed people and owners of micro businesses with 10 or fewer employees on paper, they can look like bad risks. Their income can differ greatly from year to year. Many do not get a standard W-2 tax form, making their income very hard to substantiate. And after having their taxes done and deducting business expenses, it can seem to appear that they make little to no money. Self-employed individuals and small business owners need to keep good financial records. Lenders may require mortgage applicants to provide both personal and business tax returns when applying for a home loan. If someone is considering applying for a mortgage in the next year or two, they may want to consider deducting fewer expenses to increase their net income. Lenders usually require self-employed people and small business owners to provide copies of their last two years' tax returns. Lenders now have greater expectations for self-employed people and small business owners to prove their income. If tax returns can't do it, they may want to consider providing an audited financial statement even though getting a certified public accountant to prepare the statement can cost several hundred dollars. Despite the greater requirements, small-business owners and self-employed people who handle their finances carefully will still be able to get mortgages. A mortgage lender will want to know a lot about the borrower before approving a loan application, and justifiably so. The lender will want to be guaranteed that the borrower meets their minimum level requirement for being able to pay back the loan before lending money. Where does the borrower work? How much does the borrower make? How long has the borrower been at their job? How is the borrower's income derived - steady salary or irregular income? If it's the latter, the borrower may need to provide more details to obtain a favorable interest rate. What recurring debts does the borrower have? How much does the borrower pay a month for auto loans? How many credit cards does the borrower have and how much is owed on each? How much of the borrower's monthly income do these debts account for? How much money does the borrower have in the bank? How much will be left after the borrower makes a down payment and pays closing costs? How much money is the borrower putting down? Is this the borrower's own money? If not, is it a gift from the borrower's parents? If not, is it a nonprofit agency grant? Is this mortgage for a home purchase or for a refinancing? If it's a refinance, does the borrower want to take cash out at closing to pay off other debts? If the borrower does, how much does the borrower want? Does the borrower plan to live in the house? Is it a single family home? Is it a second home? The borrower has had steady employment of two or more years with the same employer or in same line of work. The borrower has low debt: no recent major buys and has a debt-to-income ratio of 36 percent or less. The loan is for a straight home purchase or rate-and-term refinance. The property is a detached single-family home to be used by the borrower as primary residence. The borrower has a down payment of at least 5 percent of the sales price with their own money. The borrower will have at least two months' worth of mortgage payments in the bank after closing. The borrower is self-employed or a contract worker. The borrower has high debt: their credit cards maxed out or total debt-to-income ratio is more than 36 percent. The property is a duplex or condominium or to be used as a vacation home or rental. The borrower has no cash left after the down payment and closing costs. The borrower's down payment is 3 percent or less of the purchase price and the money is borrowed. Once the borrower has narrowed the lender field to a short list of finalists, it's time to compare their offers. Here are some questions to ask to help the borrower find the best mortgage lender. What is the interest rate on this mortgage? To determine exactly what the borrower will pay over the term of the loan, they need to know the rate. Rates change quickly, and if their credit is less than perfect, they may not be offered the lender's lowest figure. To effectively compare different lenders' programs, ask for the annual percentage rate (APR) of the mortgage interest, which is usually higher than the initial quoted rate because it also includes some fees. But borrowers need to realize that the APR found in advertisements can be misleading. Mortgage lenders don't always include all their in the advertizing APR, so customers who use that figure to shop may end up comparing bananas to basketballs. How many discount and origination points will the borrower pay? Lenders may charge prepaid mortgage interest points to lower the interest rate or other points that have no benefit. Find out how many the borrower will be expected to pay and which kind of points they will be. What are the closing costs? Mortgages come with fees for various services provided by lenders and other parties involved in the transaction. The borrower will want to know what those fees will be as early as possible. Lenders are required to provide a written good-faith estimate of closing costs within three days of receiving a loan application. When can the home buyer lock in the interest rate, and what will it cost them to do so? The interest rate might fluctuate between the time of applying and closing. To prevent it from going up, the borrower may want to lock in the rate for a specified period. Ask the lender if lock fees apply. Is there an early pay off penalty on this loan? Some penalties are 1 percent of the loan amount, others are equal to six months' interest, some apply only when the borrower refinances or reduces the principal balance by more than 20 percent. What is the minimum down payment required for this loan? The rate and terms of the loan will be based on a down payment figure, typically 3 percent to 20 percent of the price of the house. If the borrower can put more money down, they may be able to lower their interest rate and improve the terms or the loan. What are the qualifying guidelines of this loan? These requirements have to do with income, employment, assets, liabilities and credit history. First time homebuyer programs, VA loans and other government sponsored mortgage programs offer easier qualifying guidelines. What documents must be provided? Most lenders will require proof of income and assets, and may require other documents as well. How long will it take to process the loan application? The answer will depend on a number of variables. When the loan business is brisk, underwriters get backed up, verification takes longer, appraisals move slower and other bottlenecks develop along the loan pipeline. Lenders may say two weeks, but 45 to 60 days is probably more realistic. What might delay approval of the loan? If the borrower provides the lender with complete, accurate information, the loan process should run smoothly. If the underwriter discovers credit problems, however, there could be delays. Everywhere a person turns there are advertisements for businesses that want to provide future home buyers with a mortgage. Banks, mortgage brokers and online vendors are all striving to capture mortgage shoppers' attention and offer the borrowers' with the opportunity to borrow some cash from them. Banks are usually the first and the most traditional source of mortgage funding people think of. They offer face-to-face personal service, recognized name-brands and loan fees that are usually competitive with every other lender. They may lack the same a broad variety of loan programs others offer, however, which may mean that they are not able to offer the lowest interest rates or the lowest fees. Conversely, mortgage brokers can generally offer a large variety of loans, which includes loans for people with bad credit. That variety often results in being able to provide the lowest interest rates and the most convenient one-stop-shopping for comparison purposes. Because a borrower can sit down with a mortgage broker face-to-face, that personal service is another plus. On the downside, however, is the fact that mortgage broker's fees are usually higher, making them more expensive than other funding sources. Buying a house can be complicated, involved process. But, like most big tasks, it's much easier to understand - and accomplish – when it is broken down into smaller, easier to accomplish steps. The first step is figuring out what kind of mortgage is the best fit for the borrower, determining how much they can afford and anticipating what other steps are involved. The second step is learning how to shop for a mortgage and deal with lenders and loan brokers. The third step is determining what's involved in finalizing the deal. 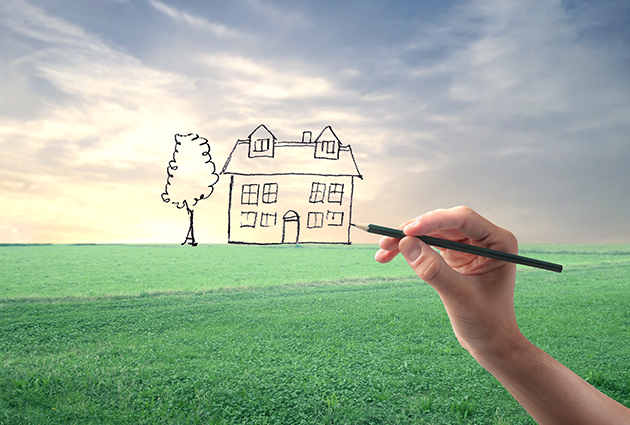 Shopping for a house is the first step toward fulfilling the American dream of owning a home. Homeownership is so American owners can even deduct the interest paid on as mortgage off their federal income tax. But remember: until the mortgage is paid off — for up to 30 years in most cases — the bank really owns the house, not the home owner, so careful consideration should be taken before jumping into the real estate market. Using a shorter loan term, paying extra & making bi-weekly payments can better help offset any transaction-based expenses. Do Home Prices Always Go Up? In the United States real estate prices have went up about 6-fold since 1970. Home price vs median income.